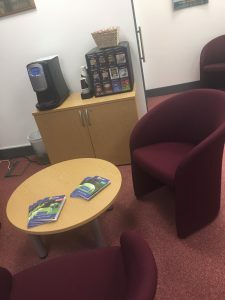 Have you ever visited your Cheadle office? Most of our members interact with us by calling us, or visiting our website. However we do get friendly faces who like to visit us in person – something that we are more than happy for people to do. We’ve realised that over the cold winter months, there may be local members who want somewhere to warm up, have a coffee, and use our facilities. Don’t feel that you need to have a burning question about your account in order to visit, you’re welcome at any time. Our lovely Customer Service Officers will be working on the reception desk, waiting for members to visit. Not only will we have a friendly face ready to welcome you, but a tea/coffee machine and a basket of biscuits will be there ready for you to enjoy! We pride ourselves on customer service, and always look for ways to improve. As a result things here are always changing (hopefully for better). 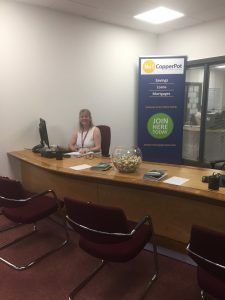 We get great feedback in regard to our Customer Service Officer’s and the service they provide over the phone, now we can ensure the members that we see face to face get the same level of great service. If you’re local to Cheadle, feel free to pop down for a coffee and a chat (maybe even talk about your accounts if you really want). We hope to see you soon!